I’ve already written about my reasons for using cloth nappies – mainly the fact that I hate taking the bins out, and especially bins filled with festering baby poo, urgh! So when I saw that Pampers were asking people to do the ‘Britain’s Driest Nappy’ challenge it got me thinking. First, I came up with all the excuses for why ‘dry’ wasn’t the be all and end all – the waste argument of course; the cost savings when using reusables; the chemicals in disposable nappies; the fact that feeling damp helps babies potty train earlier, etc etc. And then I realised that I actually have no idea how cloth nappies compare as far as keeping baby dry is concerned. I know that we only get the occasional wee leak, usually when I’ve left the nappy on too long, and that despite C being a very heavy wetter we’ve found a nappy that copes perfectly well with being on for 13 hours overnight, whether she sleeps through as she’s finally begun to recently, or if she wakes for sometimes 2-3 feeds which means she wees more overnight. And I know that we pretty much NEVER suffer the clothes-wrecking poosplosions that I remember only too well from our disposable days and see and hear other Mums talking about. But how dry do they keep C’s little bum? Is the poor girl sodden the whole time that I’m blissfully cooing over the pretty prints and colours? I thought I’d better put it to the test. This isn’t about knocking people who choose to use disposable nappies by the way – whilst I’m a cloth nappy advocate I would never judge another mum’s choices and cloth nappies aren’t for everyone (incidentally, that’s why I help run a cloth nappy library which lets people try cloth nappies for themselves before committing to buying their own). And I’m not in any way trying to knock Pampers either – they’re our nappy of choice when we do use disposables – yes although we mostly use cloth we do use disposables occasionally as well. Rather, I was genuinely curious to see how the nappies I choose to use feel against C’s skin. I picked out one of my favourite nappies (a Bumgenius Freetime, if you’re interested), a Pampers Baby Dry nappy that I had to hand, some water, tissue, and a terribly angled camera phone that beautifully accentuates my double chin. Impressed? I was, and I have to confess a little relieved too! I was actually expecting a little bit of dampness to come through the fleece, so was surprised that the tissue was pretty much bone dry. What I forgot to mention is that the fleece liner also makes it really easy to chuck poo down the toilet without having to touch it – but that’s got nothing to do with Britain’s Driest Nappy so it’s not really relevant anyway. 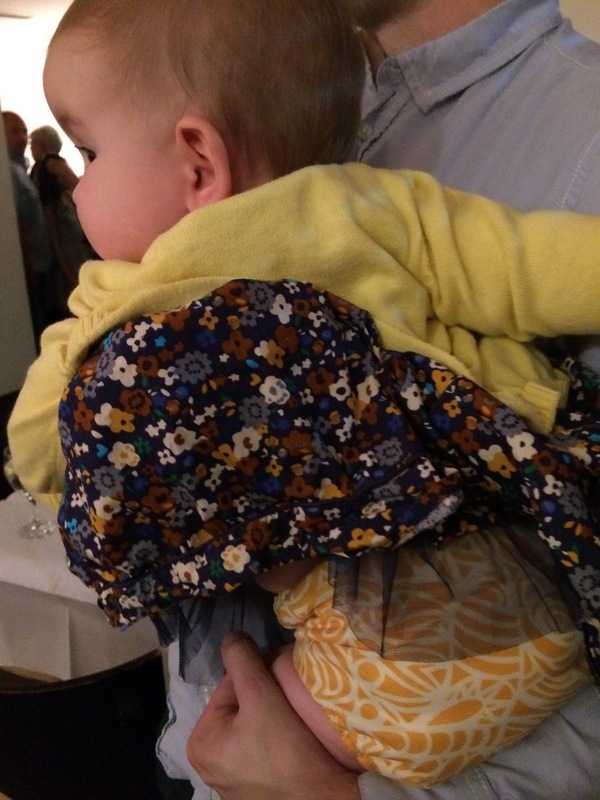 It’s just usually one of the first things I get asked about when talking about cloth nappies! I should add that the slight dampness from the Pampers nappy was really nothing to write home about, it was, in fairness, really very good at locking away the moisture. I’m just pleased that I don’t have to rely on finding excuses to justify my choice to use cloth nappies, and can rest assured that C’s bum is as dry as it is pretty. If you’re interested in trying cloth nappies you can do so cheaply, and in some cases for free, by getting in touch with your local cloth nappy library via the UK Cloth Nappy Library Network, or by searching on their map of UK Cloth Nappy Libraries. Nappy Libraries offer advice on finding the right nappies for you, as well as hiring out kits so that you can try before you buy. Some babies are more sensitive than others to the chemicals in disposables, so definitely worth trying cloth! Generally speaking people have fewer problems with nappy rash in cloth nappies, your local nappy library will definitely be able to help! There are a few libraries who do postal loans, or if they’re not currently lending they’ll often give advice! We mostly use Bumgenius Freetimes and Milovia, but also use some Bumgenius 4.0s, Charlie Banana, TotsBots V4 and a few others. We changed to cloth (mainly pocket nappies) for our 3rd and I wish we had done it sooner, I’ve had none of the terrible blistering of skin or horrendous poo explosions with her! Im always really impressed how much drier her skin is when I change her cloth nappies than her sisters ever were in disposables!! Nursery put her in pampers and change her just before I pick her up at 1230, by 1pm when I get home she is wet, sore, and the nappy has (without fail) exploded and left a trail of the jelly crystals all over her and my house! Great video! Just wondering what fleece liners you use? That’s great! Libraries usually give you everything you need to try them out, they may even give you fleece liners! Mine I think are about 3 inches wide and 9-10″ long, but it’s personal preference really, some people like them bigger, depends on the type of nappy too!